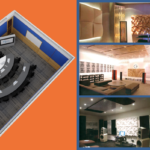 State-of-the-art Video Optimized Specialized acoustic interiors that also help improve lighting in video calls. Decorative room acoustics improve existing room acoustics! MDF wall wood grain panelling up to wainscoting level and acoustic panelling thereafter. Specially designed 125mm thick partitions filled with compressed glass wool for inside & outside noise isolation in the absence of masonry walls. Aesthetically beautiful and high quality 4mm thick nylon carpeting with green adhesive. Special ceiling design with coves to provide proper lighting required for visual meeting collaboration as well as local meetings. Choice of fabric color of acoustic panel and the carpet. All electrical & room network cabling inside the room included.